Help! I Need A Green Guide! Do you need a Green Intelligent User Guide? Fill in your particulars below and we'll ship one out to you, PRONTO! 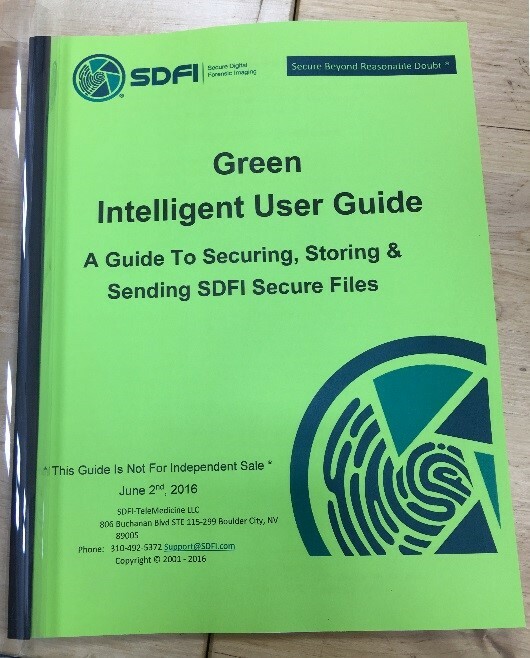 And Now A Word From The SDFI®-TeleMedicine Green Intelligent User Guide! Greetings, clients! I arrive to you, bright, fresh, clean and green when you receive your secure, digital Forensic Imaging System. I provide a guide to securing, storing and sending your SDFI secure files, but I have heard from our highly-competent Technical Team that not all of my pages are being read.